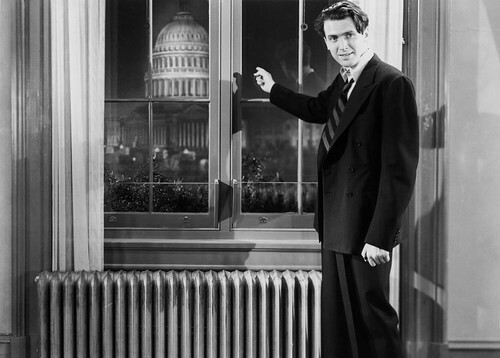 James Stewart battles corruption in the U.S. Capitol in Mr. Smith Goes to Washington. The Stars: James Stewart, Jean Arthur, and Claude Rains. Source Material: An unpublished short story by Lewis R. Foster titled, The Gentleman from Montana. 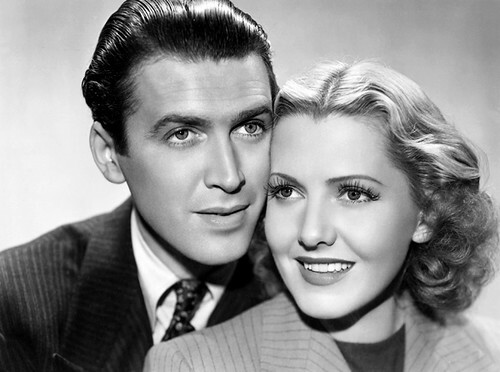 James Stewart and Jean Arthur in a publicity still for Mr. Smith Goes to Washington. 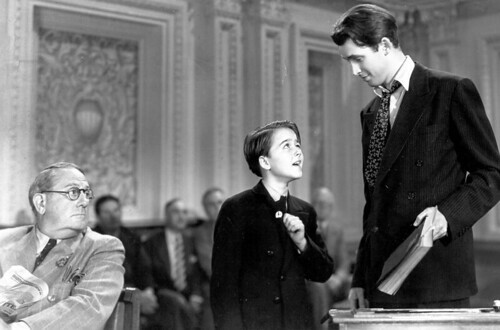 Awards: Mr. Smith Goes to Washington was named one of the top ten films of 1939 by The National Board of Review. It was nominated for 11 Academy Awards, including Capra for Best Director and Stewart for Best Actor. It won one Oscar for Best Original Story. The Plot: The governor (Guy Kibbee) of a Western state appoints Boy Rangers guide Jefferson Smith (Stewart) to the US Senate with the hopes that he will be too naive to uncover widespread corruption over a dam-building scheme. Smith stumbles a bit when he first arrives at the Capitol, but, with the help of a street-smart secretary (Arthur) and a seasoned political reporter (Thomas Mitchell), Smith takes on the all powerful political machine during a riveting filibuster on the Senate floor. 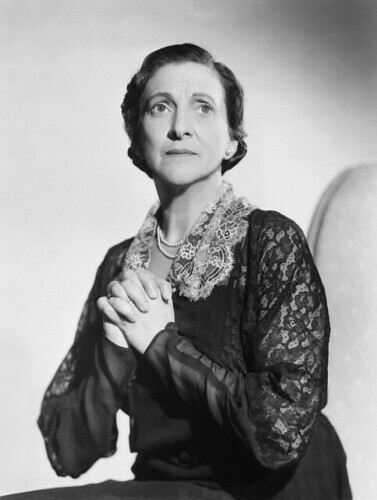 Beulah Bondi played James Stewart's mother in Mr. Smith Goes to Washington. Backstory: Columbia Pictures acquired the rights to Lewis R. Foster's unpublished short story, The Gentleman from Montana, as a vehicle for star Ralph Bellamy, but when that project fizzled out, the movie fell into the hands of Capra. At first, Capra planned to adapt the story as a sequel to his smash hit, Mr. Deeds Goes to Town (1936), but when star Gary Cooper wasn't available, he changed the story into a vehicle for Arthur and Stewart, who worked so well together in You Can't Take It With You (1938). 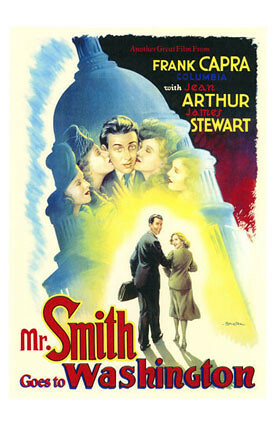 A vintage poster for Mr. Smith Goes to Washington. Best Performance: James Stewart as Jefferson Smith. Stewart was a supporting player at MGM when Capra tapped him for Mr. Smith Goes to Washington. Stewart gave many great performances in his long career, but his turn as the naive Smith who learns a harsh lesson in Washington politics, certainly ranks as one of his best. Stewart was always the most emotionally vulnerable of American actors, watch any of his fifties Westerns for proof, but he was never better than in the filibuster scene. Best scene: The 12-minute filibuster scene is one of the greatest sequences in American cinema, a combination of great acting by Stewart and the rest of the cast and exceptional direction from Capra. (clip below). Best Line: "Liberty's too precious a thing to be buried in books," Jefferson Smith (Stewart). Controversy: Today, Mr. Smith Goes to Washington is as American as apple pie, but it stirred up a lot of controversy in 1939. The film had a star-spangled premiere at Constitution Hall in Washington D.C. with a National Guard band playing patriotic tunes and immense press coverage. 4,000 people, including 45 senators, packed into the theater, but about halfway through the film people began to walk out and even shout at the screen because they didn't like the way Washington politics were portrayed onscreen. Kentucky Senator Alben Barkley was outraged by Harry Carey's portrayal of the vice president, telling the press, that Mr. Smith Goes to Washington showed the Senate as "the biggest nincompoops on record." South Carolina's James Byrnes even wanted to ban the film because he feared it would make America look bad to other countries. Newly appointed Senator Jefferson Smith (James Stewart) finds his desk with the help of a pageboy (Dickie Jones). Overseas Reaction: Senator Byrnes didn't need to worry about the Fascist reaction to Mr. Smith Goes to Washington. In fact, they hated the film even more than the senators did. Mr. Smith Goes to Washington was banned by Adolf Hitler, Benito Mussolini, General Francisco Franco, and Joseph Stalin (there's a line-up for you). In fact, the film was banned in Nazi-occupied France, but one Paris theater owner defied the Germans by playing the movie for 30 days non-stop. Fun Fact: Stewart had a doctor spray dichloride of mercury down his throat to give him a raspy voice during the filibuster scene. 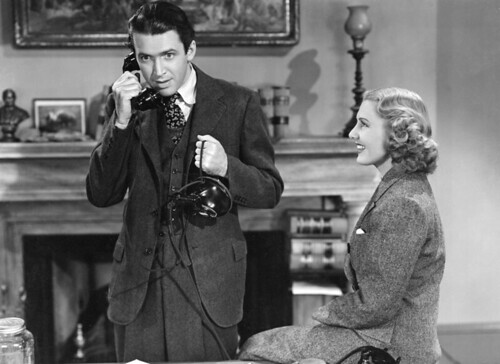 Jeffeson Smith (James Stewart) answers the phone in his Senate office while Miss Saunders (Jean Arthur) looks on in Mr. Smith Goes to Washington. Why it's essential: Mr. Smith Goes to Washington is one of the great political films made in old Hollywood. The early parts of the film are delightful comedy with the great chemistry between Stewart and Arthur on full display. The second half of the film is a taut drama with the filibuster scene featuring one of the best sequences in American film. Availability: Mr. Smith Goes to Washington is available for streaming on Watch TCM. It is also available on DVD and video on demand. Next Sunday, there will be a special Memorial Day edition of the essentials featuring the World War I drama, Nurse Edith Cavell. I haven't been to Washington D.C. since grade school but watching this movie and Born Yesterday always make me want to go back and see it as an adult.